XiaoZhi Lim is a freelance writer in Natick, Massachusetts. A few times every year, Christopher Higgins’s laboratory in Golden, Colorado, receives a special delivery in the mail. Inside an ice-box, Higgins finds several vials, each holding up to 250 millilitres of water collected from boreholes near US military bases. The water looks unremarkable, but it is contaminated with synthetic compounds called fluorochemicals, which have been generating increasing concern around the world. This class of chemical has shown up in worrying concentrations in rivers, soils and people’s bloodstreams from Europe to Australia. Some of the oldest compounds have been studied and banned, but new, mystery types are appearing all the time. Higgins’ team, at the Colorado School of Mines, is one of several environmental-chemistry labs being funded by the US Department of Defense to work out the chemicals’ structures. “I think they are one of the most complex groups of pollutants out there,” he says. The fluorochemicals story used to be simple. In the 1930s, the chemical industry created surfactant compounds with a unique ability to repel both grease and water, because their carbon chains were swaddled in fluorine atoms. Within 30 years, they were everywhere: in non-stick pans, raincoats, food wrappings, fire-fighting foams and all kinds of stain-proof coatings. Chemists would later call this fluorinated family ‘per- and poly-fluoroalkyl substances’, or PFASs. Their carbon–fluorine bonds are among the strongest known in nature — so the molecules don’t degrade. By the twenty-first century, internal industry studies had linked growing concentrations of two of the most popular fluorochemicals, PFOA (perfluorooctanoic acid) and PFOS (perfluorooctane sulfonic acid), to a bevy of health issues, including cancers and problems during pregnancies. Companies said they would stop using them, and countries agreed in 2009 to phase out PFOS under the Stockholm Convention, which controls persistent pollutants; this year PFOA is expected to be added to the banned list. But because the molecules don’t naturally degrade, hundreds of millions of people in Europe, the United States, Australia and China are still exposed to levels of these compounds that exceed what regulatory agencies deem healthy. Starting in the 2000s, some industrial firms switched to formulations that they said were safer. But those, too, contain fluorine-carrying carbon chains. And because the chemical industry does not regularly disclose formulations that are trade secrets, scientists are starting from scratch in working out whether PFASs besides PFOA and PFOS might be causing problems. “We’re going back to square one,” says Philippe Grandjean, an epidemiologist at the Harvard School of Public Health in Boston, Massachusetts, who studies the effects of persistent pollutants. Now, environmental chemists, epidemiologists and toxicologists are trying to deduce how many PFASs there are, track those that are in the environment and assess potential harm. By last May, researchers had tallied a startling 4,730 PFAS-related structures from patent filings and chemical registries, any of which might be in commercial use (see go.nature.com/2bekua3). That list is still growing, says Zhanyun Wang, an environmental scientist at the Swiss Federal Institute of Technology in Zurich who led the work. (By comparison with other well-known chemical pollutants, there are just 75 known dioxins and 209 polychlorinated biphenyls, or PCBs.) Not all PFASs are cause for concern, says Eeva Leinala, principal administrator in the Environment, Health and Safety Programme of the Organisation for Economic Co-operation and Development in Paris, which commissioned Wang’s study. But for many, there is no toxicity information, she says. That gap is a worry because the compounds hang around so long in the environment. “These are the most persistent chemicals we are facing today,” says Wang. Water and soil near military bases worldwide are rich in PFASs because of fire-fighting foams sprayed there during training exercises. The foams tend to be complex formulations and can contain hundreds of PFASs. They were introduced in the 1960s to extinguish fuel fires, and performed so well that the US military set them as the standard for fire protection at bases and major airports. They represent a small fraction of fluorochemical production, but are a major part of the contamination problem because they get discharged directly into the environment, says Jennifer Field, an environmental chemist at Oregon State University in Corvallis, who collaborates with Higgins. Field and Higgins’s research teams analyse the water using mass spectrometers: machines that separate out and weigh the molecules present in a sample, and then break these compounds into ionized fragments before weighing each smaller piece again. It’s easy to spot known PFASs, such as PFOS and PFOA, because their characteristic fingerprints are already known. But for fragments with unfamiliar masses, researchers must deduce the structures, and then surmise what the original compounds might be. “You start using a chemist’s brain and a pencil and a piece of paper to sketch things out,” says Mark Strynar, an analytical chemist at the US Environmental Protection Agency’s National Exposure Research Laboratory in Research Triangle Park, North Carolina. To be sure that the chemical is what they think it is, researchers would ideally compare their findings with a mass-spectrometer reading of a clean, pure sample — a reference standard. But these are hard to come by because manufacturers don’t always have them, and when they do, they often say that precise structures are confidential business information. So researchers instead declare that they have found PFASs to varying degrees of confidence, on a scale3 that Schymanski introduced in 2014. Researchers also need reference standards to accurately quantify PFAS concentrations in the blood and investigate health impacts. 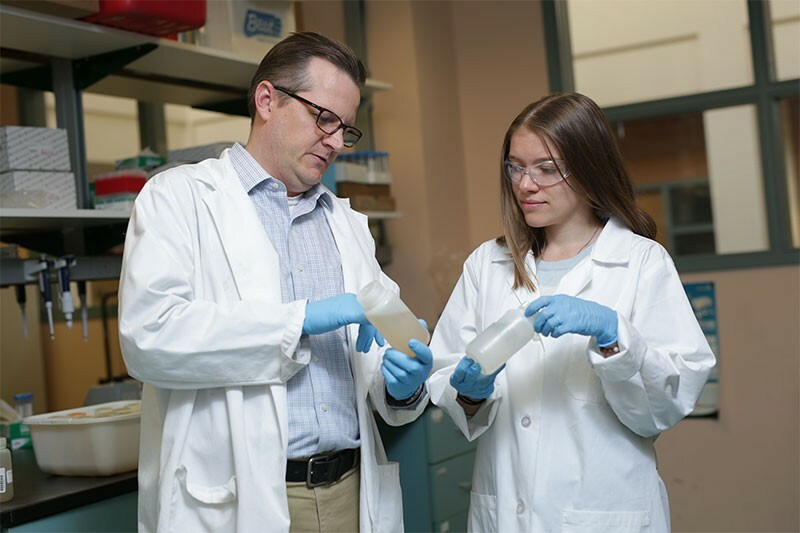 To meet that need, chemists Alan McAlees and Nicole Riddell at Wellington Laboratories in Guelph, Canada, have been synthesizing their own PFASs. They have so far made around 100 structures. Three of those were made because they were spotted in Field and Higgins’s non-target analyses — which should help chemists to confirm their suspicions of what’s in the environment. The new PFAS molecules have structures that chemical firms say makes them less problematic than PFOA or PFOS. PFOA has a chain of eight carbons — it is sometimes called, simply, C8 — but firms have shifted to molecules with chains of six or four carbons (see ‘Fluorinated family’). They say that these are more soluble and leave the bloodstream more quickly, so are less likely to accumulate in animals and people. Another design inserts an oxygen atom in the fluorinated carbon chain, a structure that is said to break down faster. But despite industry assurances, molecules with fluorine-carrying carbon chains won’t degrade easily, says Rolf Halden, an environmental engineer at Arizona State University in Tempe. Asked to comment on this controversy, the FluoroCouncil, an industry group in Washington DC, argues that at least some PFASs are safe: it points to reviews that it funded and published last month indicating that the six-carbon perfluorohexanoic acid (PFHxA), which some more-complex PFAS structures naturally transform into, is non-carcinogenic and non-bioaccumulative, and that human exposure to it is “low and infrequent”4,5. Those claims are technically correct, says Ian Ross, who leads consulting on PFASs at Arcadis, an engineering and consulting company headquartered in Amsterdam. But PFHxA is only one of many PFASs, he says, and complex mixtures can leave all kinds of mystery intermediate compounds in the environment. A study6 published last month, for instance, found that one PFAS commonly used in foam could turn into nine different intermediates before ending up as PFHxA. Jamie DeWitt, a toxicologist at East Carolina University in Greenville, adds that the volume of data known about PFHxA is much smaller than that for PFOA and PFOS. Much of the evidence for the dangers of these compounds came from a science panel that emerged from the first huge PFAS class-action lawsuit, brought against the US conglomerate DuPont in the small town of Parkersburg, West Virginia, in 2001. There, several DuPont employees who worked directly with C8 had become sick. The firm was accused of causing harm to people who drank water containing C8, which it had discharged into the environment. In 2004, the lawsuit was settled: the firm agreed to pay US$70 million to a health and education fund, and to fund research to find out whether C8 was linked to disease. The result was an epidemiological study of almost 70,000 people which, by 2012, had linked C8 to diseases including kidney and testicular cancers, pregnancy-induced hypertension, ulcerative colitis and high cholesterol (see go.nature.com/2wzex8e). (Under the settlement’s terms, DuPont cannot dispute the study’s findings.) After this, some 3,550 people involved in the class-action lawsuit who had these diseases sued DuPont individually; in February 2017, the cases were all settled together for $671 million. Neither settlement established wrongdoing by DuPont. In other research, Grandjean has studied how some of these substances affect children’s development. For 20 years, he has followed 500 children in the Faroe Islands from birth, measuring concentrations of five PFASs in their mothers’ blood and the children’s blood. (Grandjean picked the Faroese because, owing to their relatively isolated location, only a few PFASs show up in their blood, making the group easier to study than populations elsewhere.) In 2012, he reported that children with higher PFAS levels were less able to develop antibodies in response to vaccines7. That finding, among others, led the European Food Safety Authority in March 2018 to revise its decade-old safety limits for exposure to PFOS and PFOA: down from 1,050 nanograms per kilogram of body weight per week to 13 ng kg−1 for PFOS, and from 10,500 ng kg−1 to 6 ng kg−1 for PFOA. That, says the agency, means that a “considerable proportion” of the population is exposed to unsafe levels. The agency also says that it will publish a decision by December this year on whether to set safety limits for 25 other PFASs — and on whether those PFASs could be assessed in mixtures, rather than individually. The US Environmental Protection Agency (EPA) did not set guidelines for PFOS and PFOA exposure until 2016; those recommend that drinking water should not contain concentrations higher than 70 parts per trillion (p.p.t., or 70 ng kg−1) of the two substances combined. Last year, the US Department of Health and Human Services released a draft study suggesting that safe levels should be set much lower, at 7 p.p.t. for PFOS and 11 p.p.t. for PFOA (see go.nature.com/2crcs3c). Some 110 million Americans drink water with PFAS levels that surpass this recommendation, and 6 million have water with higher levels than the EPA’s guidelines. Despite studying PFOS and PFOA for two decades, toxicologists are still struggling to work out how PFASs cause problems in the body. “I don’t think we have achieved a consensus on the understanding of a specific mechanism,” says DeWitt. Studies in rodents8,9 exposed to PFOA for long periods of time, for instance, show that this can result in activation of a receptor called PPAR-α, a protein that regulates lipid metabolism in the liver and elsewhere, and so can lead to liver tumours. Humans also have this receptor — but do not seem to get liver tumours from PFOA exposure. The finding could be related to the other kinds of toxicity that PFASs have been linked to, but it’s not clear yet, DeWitt says. Wang hopes to build a more comprehensive PFAS universe than the thousands that he has already described. A potential new source of information will come from Europe. Under chemicals legislation introduced in 2006, manufacturers have since November 2010 had to file information about compounds they put on the market, although compounds produced or imported in small volumes (1–100 tonnes) per year were exempt until last May, and production at even lower levels doesn’t need to be registered at all. Wang’s studies could help speed up the non-target detective work. He and Schymanski are now collaborating to build a software tool that would automatically compile the structures in the PFAS universe, then fragment them and classify the fragments by mass. One day, researchers could use the tool to identify unknown masses spotted in environmental samples. Early last October, a tanker truck tipped over on a ramp joining the I-95 highway in Providence, Rhode Island, and spilt roughly 48,000 litres of petrol. 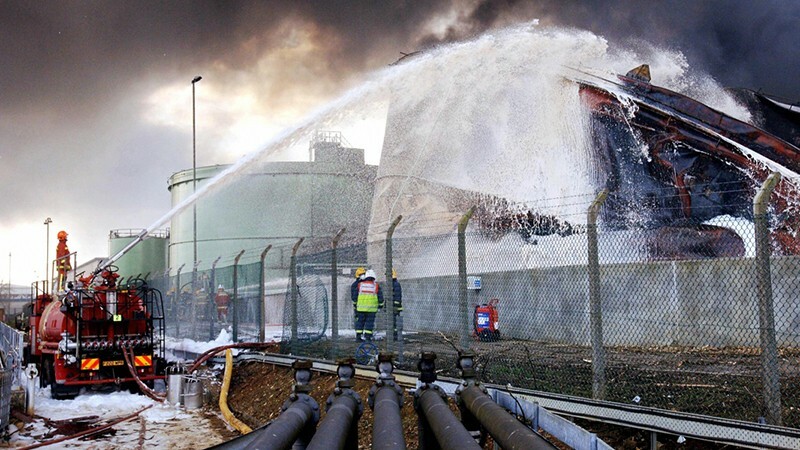 Fire-fighting foams containing six-carbon PFASs were sprayed over the spill as a precaution. The accident occurred next to the Providence River, which empties into Narragansett Bay some 10 kilometres away. 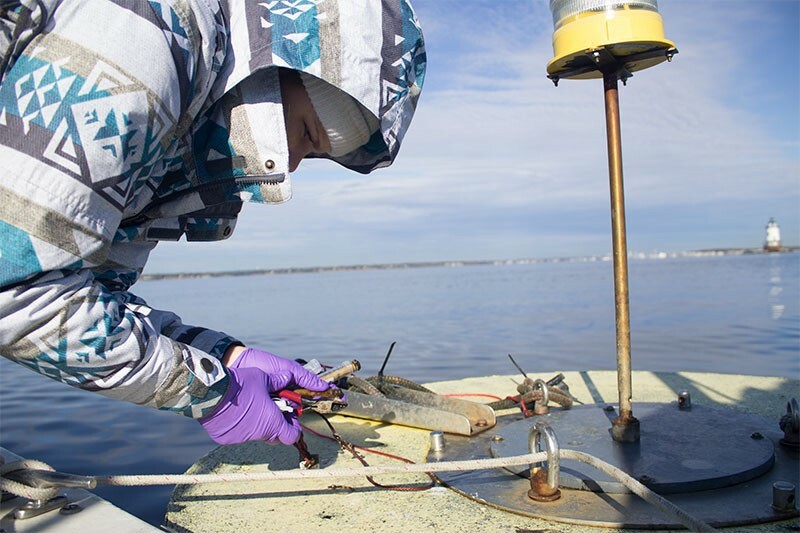 Christine Gardiner, a master’s student at the University of Rhode Island in Kingstown, quickly e-mailed staff at the Rhode Island Department of Environmental Management, who maintain a network of buoys in Narragansett Bay during the summer to monitor water quality. Gardiner joined the next trip out to the bay, bringing empty bottles to collect water at each buoy, and home-made porous tubes filled with ionic powders that trap PFASs. These ‘passive samplers’ get attached to a rope on each buoy and remain in the water for about two weeks. Gardiner plans to analyse the samples for about 20 known PFASs to see whether the method can capture them. She also hopes to see how the PFASs travelled through the bay. Together with her supervisor, Rainer Lohmann, and Grandjean, Gardiner is participating in a five-year $8.5-million project funded by the US National Institute of Environmental Health Sciences. A collaborator in the project, Elsie Sunderland at Harvard University in Cambridge, Massachusetts, is tracking some 30 PFASs from their sources to where they end up in the environment. Sunderland hopes that researchers could help people with high PFAS levels in their blood to trace the source of their exposure — perhaps to fish consumption, their drinking water or house dust. How to remove the chemicals is another problem. There are at least 30 PFAS remediation projects happening in the United States, Europe and Australia, each one costing a million dollars or more. These efforts typically use filters that can catch long-chained PFASs: those with eight or more carbons. But the shorter-chained substitutes don’t stick as well to the filters and break free much faster, says Detlef Knappe, an environmental engineer at North Carolina State University in Raleigh. One approach was demonstrated in April 2017, when a fire-fighting foam spill at Australia’s Brisbane Airport caused some 22,000 litres to enter nearby Boggy Creek. Authorities dammed the creek and pumped the water out, storing it in hundreds of tanks on tarmac nearby. Researchers from Arcadis used ozone to oxidize much of the organic matter, a process that created lots of minuscule air bubbles to trap the pollutants, says Ross. “They like to stick their perfluoroalkyl chains in air,” he says. The bubbly foam, concentrated with PFASs, rose to the top and was skimmed off. But then there is the question of what to do with the foam, or carbon filters, that have become concentrated with PFASs. Currently, much of that ends up in landfills. But that just moves the problem, says Knappe. PFASs can migrate out of the filters and seep into the ground with rain and other liquids in unlined landfills, threatening groundwater. Indeed, the multinational manufacturing firm 3M was sued in Minnesota for having “deliberately disregarded the high probability of injury to Minnesota’s natural resources” by landfilling PFAS-contaminated waste, which then leaked into groundwater. The lawsuit was settled for $850 million in February 2018 and did not attribute any legal responsibility to 3M for contamination or injury. Even when landfills are lined, as is now standard in developed countries, fluids that pool at the bottom often end up in wastewater treatment plants that are not equipped to remove PFASs, Knappe says, so the chemicals end up in waterways anyway. In August last year, the EPA put up $6 million for research proposals tackling PFAS-contaminated fluids in landfills. Ideally, chemists would find a way to remove fluorine atoms from the carbon chains to form stable, safe fluoride ions. But that is easier said than done. High-temperature incineration could break the strong carbon–fluorine bond, and the Boggy Creek foam was ultimately incinerated at more than 1,100 °C, says Ross. But very little is known about what the PFASs turn into when incinerated, and whether the incineration products are safe. “I still consider that as a research need,” says Knappe. Arcadis researchers are working to improve and scale up an idea to use ultrasound pulses to defluorinate PFASs, says Ross. These create tiny bubbles that expand, contract and ultimately explode; the temperatures on the bubbles’ surfaces are high enough to split fluorine from carbon. For now, the biggest priority should be to prevent PFAS contamination, says Knappe. That means pursuing responsible manufacturing and disposal processes, he says. But some suggest going further and phasing out the use of PFASs where they’re not needed. The Stockholm Convention process is used to list problematic PFASs individually; after PFOA is banned, the Stockholm committee has agreed to evaluate perfluorohexane sulfonate, or PFHxS. But Cousins, Wang and Lohmann think that the default position should be to restrict the use of all PFASs in products unless they provide essential functions. They are writing a regulatory framework laying out this idea, which they plan to publish later this year. The FluoroCouncil disagrees with this idea. “It is not appropriate to make broad conclusions or impose a one-size fits all regulatory approach for this wide range of substances,” a spokesperson says. Still, views have already shifted on the need for PFASs in fire-fighting foams. So long as a foam produces a “stable bubble blanket” that prevents oxygen reaching a fire, says Ross, it can be effective without PFASs. Many airports worldwide, including Sydney, London Heathrow and Changi in Singapore have already gone fluorine-free, he says. And last September, the Federal Aviation Administration exempted US commercial airports from military standards, allowing them to begin switching to fluorine-free foams. Cousins is now going over the myriad other applications for PFASs. Among the surprising ones are some cosmetics, which seem to contain PFASs for no apparent reason, he says. And elite skiers use fluorinated ski waxes to give them an edge over their competitors — but no country would disadvantage their athletes by banning fluorinated waxes unilaterally, he says. Fluorinated polymers present perhaps the trickiest case: they are useful and are widely regarded as safe. They coat almost all electronic components and solar panels. They are in medical devices and even the tubing in high-resolution mass spectrometers. (Researchers take precautions to avoid sample contamination.) And very few PFAS molecules are shed from the polymers while they are in use. Yet lots of PFAS by-products are associated with their manufacture, Cousins says. Sometimes, there are no viable alternatives. One of seven exemptions in a recommendation on banning PFOA in the Stockholm Convention involves protective clothing for medical personnel and workers in the oil and gas industry. These people need protection from both watery and oily fluids, and only PFASs confer that property in materials. Correction 11 February 2019: An earlier version of this story misnamed the European Food Safety Authority. The article has also been modified to make clear that both lined and unlined landfills pose a risk to groundwater contamination. Clarification 18 March 2019: An earlier version of this article created the impression that unlined landfills are frequently used for PFAS waste. In fact, lined landfills are standard in developed countries. Clarification 26 March 2019: This story has been modified to make clear Detlef Knappe did not claim that some new PFASs evade the filter completely. Xiao, F. Water Res. 124, 482-495 (2017). Wang, Y. et al. Environ. Sci. Technol. 52, 11007–11016 (2018). Schymanski, E. L. et al. Environ. Sci. Technol. 48, 2097–2098 (2014). Luz, A. L., Anderson, J. K., Goodrum, P. & Durda, J. Reg. Toxicol. Pharmacol. 103, 41–55 (2019). Anderson, J. K., Luz, A. L., Goodrum, P. & Durda, J. Reg. Toxicol. Pharmacol. 103, 10–20 (2019). Shaw, D. M. J. et al. Sci. Total Environ. 647, 690–698 (2019). Grandjean, P. et al. J. Am. Med. Assoc. 307, 391–397 (2012). Corton, J. C., Peters, J. M. & Klaunig, J. E. Arch. Toxicol. 92, 83–119 (2018). Corton, J. C. et al. Crit. Rev. Toxicol. 44, 1–49 (2014).